I grew up in the era when there was one heavyweight champion . You didn't have to guess who the champion was . It was just one . There was no distinction between WBA,WBC ,IBF champions . That's the way boxing should be . One man One Title. Mike Tyson and Michael Spinks met to clear up the heavyweight confusion in the heavyweight ranks , It was a different day .The fight was promoted by Don King , promoted by Donald Trump, and endorsed by Muhammad Ali . At ringside was Robin Givens. Tuesday Night Fights brings you the classic Tyson-Spinks fight in its entirety. Tuesday Night fights brought to you by Diet Pepsi ,you tube,and edgray4america. Until next week , I will save you a seat at ringside. Money Madness Money returns .This time just a brief message on PIGS! PIGS are the counties of Portugal , Ireland , Greece , and Spain! The debt ceiling debacle is resolved . The next financial crisis is the failure of these counties or any of the four . If the Tea Party activists had their way we would have been joining the PIGS! If any of these counties fail , he crisis will be felt on Wall Street.Imagine Italy down the tubes , and Ireland down the tubes , America has a large anmount of its population that descended from these countries. If these countries fail economically a boomerang that will devastate America and Western Europe.American political pressure from voters who have a genealogical ties to Ireland ,and Greece will see to it that these countries do not fail economically. Meanwhile the two former colonial powers of Portugal and Spain have seen their best days behind them .These two countries stand on the precipice of disaster. One bad move can lead to financial meltdown .This meltdown is soul sapping on a sick America economy . We will have to get busy.Today is the day our economy must turn around . Lower your debt,stay focused ,and jump back in to the game and buy stocks. The recent storms and earthquakes remind me of how life is. We are either in a storm ,just left a storm ,or headed to a storm .We must keep our eyes on the prize.Though our spirit may falter , we must put our hands in the hands of The Man from Galilee. Gospel Sunday opens up with Fred Hammond . He sings "A Song of Strength " . Hurricanes, Earthquakes ,Tornadoes can come and go.They are mere moments that test our fortitude ,our strength,our character,our spirit. We must allways find someone to lean on. Family ,friends , even strangers , can lean on us , and we can LEAN ON EACH OTHER.The spirtual weathercast has been forecasted : We are in a storm . Though the storm might be fierce,the rain of sorrow must never drown out the sunshine of hope. We must allways Keep our Head to the sky.Because we can Win, stay optimistic. Sounds of Blackness - "Optimistic" . In life things don't always work out the way we want it. Through the storm , we must never give up, we must stay optimistic, and finish the race .Sometimes we have to lean on our Father ,he will give us direction ,the energy ,the courage to finish the race.The triumph of the will is the spirit that lives in all of us.Thank you for allowing me to share ,and God Bless. Today marks the birthday of the greatest political liberator with the exception of Martin Luther King Jr. for African -Americans in the 20th century. His name LBJ: for young folks LBJ stands for Lyndon Baines Johnson, not Lebron James.Let's Flashback and prove our thesis statement .LBJ had more impact on black America than any other president. I have had some colleagues offering questions to my social media sites to challenge my political positions.I submit to them this morning:The greatest president for the United States in regards to being an change agent with direct impact on millions of black folk was LBJ. Flashbacks: Summer,1963 : The "March on Washington" had not occurred. Dr. King's dream speech was not given yet.President Kennedy's Civil Rights Bill was languishing in Congress. Presiding over the powerful Senate committees were arch segregationist Democratic senators. The vice president was a good old boy from Texas. Lyndon Johnson. His job to use his influence to help pass the bill. Flashback: November 22 ,1963 :President Kennedy in a campaign trip ,yes that was what it was. A campaign trip for the 1964 election was assassinated in the southern city of Dallas. Violence in the south was a contagion. President Kennedy dies and many now question whether the Civil Rights Bill died with him. Flashback: The Johnson treatment.A relentless full force of energy ,threats , charm , promises ,and ego. Johnson uses every political lever under his command to pass the Civil Rights Act of 1964 . Overcoming southern Democratic leaders .LBJ appeals to moderate Republicans.Republicans who worked for bipartisanship because it was right.Republicans &Democrats both voted for Civil Rights bills in 1964 southern Democrats did not. Flashback:Civil Rights marchers are terrorized by Southern segregationist terrorism.While the Kennedy brothers offered deals to placate the political leaders of Alabama and Mississippi. Johnson took direct control by sending in the United States Army to protect the Voting Acts Marchers in Alabama. Subsequently the Voting Rights Act of 1965 was signed into law. Thus liberating millions of black folk in the south who could not exercise heir constitutional right to vote. Flashback: Neshoba County: 3 Civil Rights activists were missing. Things like that happened in Mississippi all the time .LBJ sends in the US Army and Navy " I want ya'll to drain every swamp and bring them boys back home to their mama"s." The 3 Civil Rights activists bodies were found . Flash forward : Before you could get an Obama ,you had to have the right to vote. Black America didn't .Basic civil rights were routinely, and systematically violated.Johnson stopped that too.Leadership starts from the top ,and if it was not for LBJ ,Civil Rights and the gains of the last 48 years would not have occurred . Thank you and Happy Birthday President Johnson ! The Vault is steamy today ! Vonda is throwing out all the cuts because she got it like that way ! She is in the inspiration and I am the perspiration for the best video back in the day blog in the history of man ! "I Just Want To Be " ! tHROWIN dOWN WITH rICK jAMES =============== You and I "
There is a car parked out side the vault that is double parked next to the lime green Pacer with the red rims ! Someone please move the "Little Red Corvette " ! In the vault" It's nothing but a gangsta party with Amerikas Most Wanted ".If you want an explicit version go to VIP in Vonda's Vault ! Until the next time we see you walk through the vault ! Jazzy Friday features the Rand B connection . Thats a connection where you say , man I heard that song ! We will play jazz each Friday and every Friday for u and the American people.This Friday we open with former NBA ALL star Waymon Tisdale . "We can't Hide Love " for the love of our music. The Love for Music knows no bounds , Najee talks about "Sweet Love " . Anita Baker standard done instrumental sound , a love that is so Sweet. Loves our theme for tonight .Norman Brown says 'Thats the Way Love Goes" . We gotta do it, it's a smooth groove for us all ! "Human Nature " by Miles Davis is a classic , listen to this mellowed , tune that wishes us all to be in the nature of LoVE ! Our Jazz Blog goes into overtime , thanks Casey for requesting and asking "Where's the Jazz ". Its right here ! The Jazz R and B Connection ! We leave you this week for the hour is short , but the music is long ! We will creep out of here with Fourplay as they cover Marvin Gaye's " After The Dance". We will see you next week around the corner Jazz Corner . Women's Independence Day is August 26 on this day the in 1920 19 th Amendment was ratified given women the right to vote. With the stroke of the pen Universal suffrage was at last a fact for all American citizens . It was a long battle for self determination was realized. Still women to this day see a glass ceiling. With each passing generation that ceiling cracks. From reordering the newspapers to ban the "Women's section' to equal pay laws that grant women the same economic opportunities of men. Still they rise ,like a phoenix , out of the ashes to save humanity. As legislators, politicians ,doctors ,lawyers,and much more they are reordering American society to make it inclusive. We are only as strong as our weakest link, and women are our backbone. Happy Women's Independence Day 2011 ! I am a big fan of boxing , and in Tuesday Night Fights will be one of the staples of this blog. This is a takeoff on Tuesday Night Fights of years back . Back in the day fighters are better than what we have today. In our first installment , we will look at Muhammad Ali at his best, in his prime. The speed and power of Ali was demonstrated in Houston Texas ,at the Astrodome. The defense of his title against number 1 contender Cleveland Williams. In Round 1 ,Ali won the first round by dancing around the ring , using his superior speed , footwork , and tremendous punching power .Ali aka Cassius Clay displayed the "Ali Shuffle". In Round 2 , more of the same. Williams goes down by a terrific combination. Williams gets back up and is knocked down again . Williams is floored for a third time at the bell. In Round 3 Ali shuffles to victory ! Look at the footwork of the Greatest! The ref stops the fight after the fourth knockdown. Winner and Stll Champion ! Tuesday Night Fights brought to you by DCON Roach Traps ! See ya next week , I will save you a seat ringside ! Nick Ashford has passed away. Ashford the male half of the dynamic husband-wife songwriting team comprised of him and wife Valerie Simpson were prolific songwriters for over four generations.The duo received acclamation by being part of the Motown song writing factory producing hits for virtual every Motown artist. The couple steamy and endearing duets were touching because they exemplified long lasting love.
" It Seems To Hang On "
It"s been a long time since the music industry had a couple write songs of love that touched many. It was Good to Us .
" Is It Still Good To Ya"
For Loves Sakes Each Mistake You Forgave. NO mistake that Ashford and Simpson were one of the greatest song writing duos of all time . This NFL Season will bring forth heroes on the field. The season will start and we will root for our favorite players action on the field. It is what they do off the field that distinguishes them from athletes to heroes. I bear witness that the spirit of man never dies as long as you help others. who now plays for the San Diego Chargers is a role model who takes time to help the community.English is a beast on the field and a gentleman off the field. The San Diego Chargers number one pick in the 2009 draft,and the 16th pick overall is making his presence felt in a meaningful way. The amazing feat that Larry English accomplishes this on the field , while serving as a spokesman for American Lung Association . English battles asthma with the same ferocity that he displays on the field. "As an individual living with asthma, I truly understand the challenges this disease presents" says Larry. 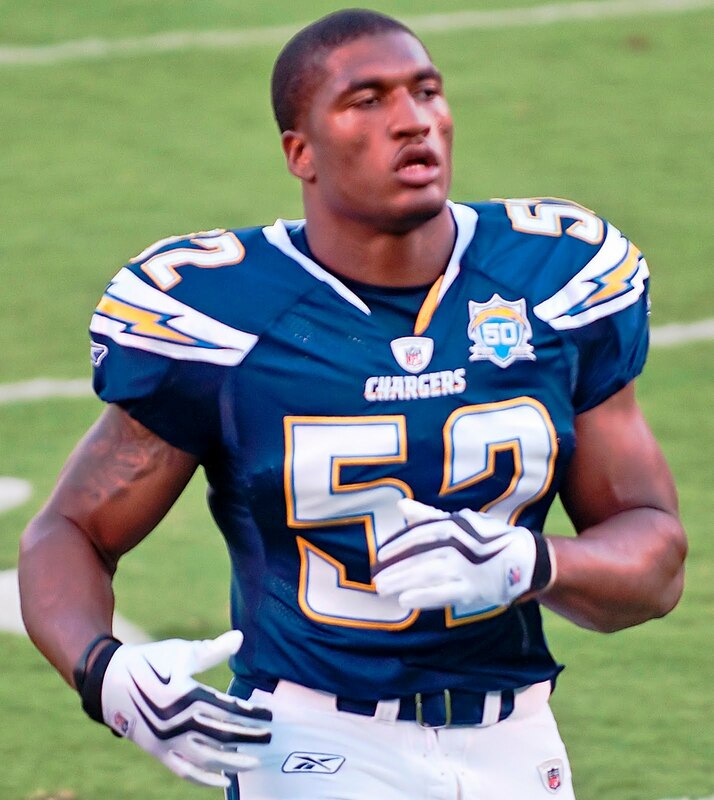 Larry English and his mom Susan English give back daily as heroes and heroines of humanity.They prove that you can be a champion by what youdo off the field. Thanks Susan and Larry for all you do ! This Sunday Gospel Sunday we look forward with prayers for all of your students as as they leave home for college .We pray for those who are with us as they start the school year. We pray for those who are without work and those who are with work that they manage their finances to success. Gospel Sunday says ,'No Weapon Formed Against Me ".
" I Know I Have Been Changed" have patience with me God Is not finished with me.GOD ONLY JUDGES, I wait on his direction . I am Walking to MY HOLY FATHER , I am To Close To Turn Around ! I see you William ! In Life we are in a Battle , We Get Hit , We Fall Down , We Get Up ! 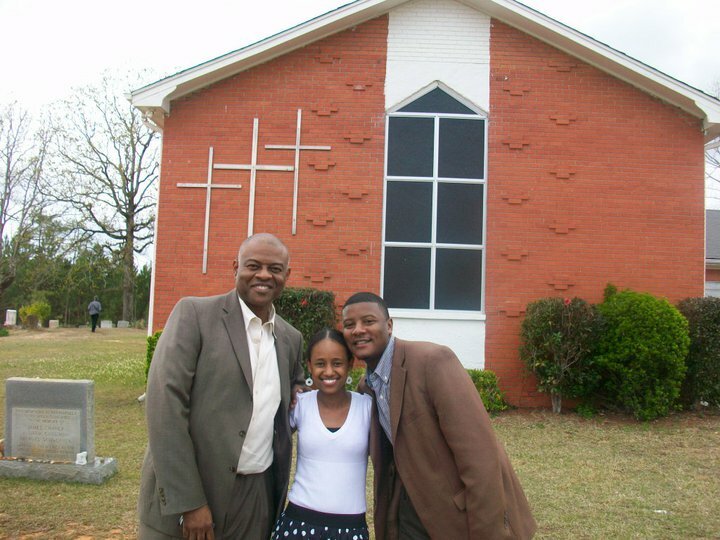 We All Know' .Weeping may endure for a night , but Joy cometh in the morning ! It'sMorning Get Up ! Surely GOD IS ABLE TO CARRY US THROUGH ,If HE says the same we will see you next week ! Tonight , August 20 ,2011 Liz Mikel and friends are playing at the Dallas Music Hall at Fair Park ! Enjoy Quality Entertainment from Liz Mikel . I remember Liz Mikel from our days at Carter High School in Dallas,Texas .It is a rare treat to see people who have followed their passion as children to adults . Many years spent perfecting her craft in the theater has produced roles in film , stage,and music. From Friday Night Lights to the Addision WaterTower, she has proven that she is quite a Woman ! A standard by many but mastered by few. 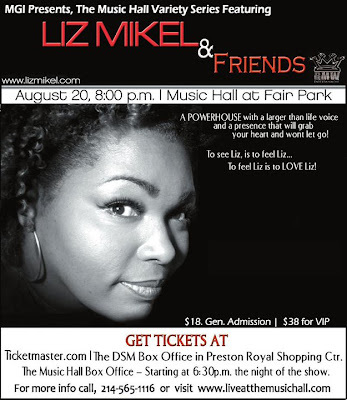 Liz Mikel does justice to this standard: "My Funny Valentine" . 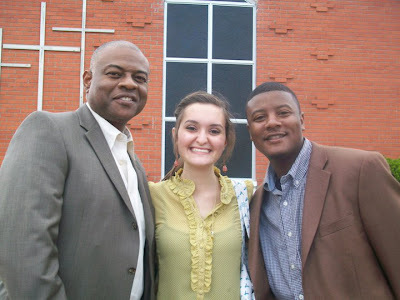 The acting skills of Liz were featured in " Roscoe Jenkins". Catch a Rising Star ,and put in your pocket. Thanks Liz for all you do! Gotta Slow it Down.... What Kind of A Man Would I Be. If I didn't play Love Ballad ! Who singing the harmony in here ! Kirk Whalum opens up with , Memphis Soul himself ...Play that sax. So sweet to be missed .... "Sweet Love ' as done by Boney James ! The Crusaders featuring Ray Parker Jr. play brother , who you gonna call ! Ray is the MAN ! Love Me Some Miles Davis : "It's Human Nature"
the best jazz club in Dallas @ Brooklyns. Jerry Jones made a clutch decision today.In his continuing quest to honor all Cowboys who were great contributors to this storied franchise added one more star. 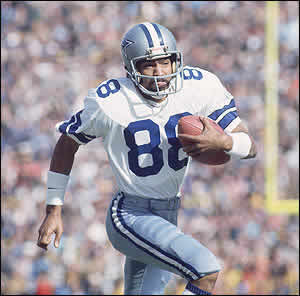 He threw to the original.Before we got the Playmaker,we had Mr, Clutch Drew Pearson. The unheralded Tulsa University flanker was not drafted by the Dallas Cowboys, but came into the league as a free agent.The Dallas Cowboys got one of the best deals of the day.Drew before he became Mr. Clutch was a quarterback at South River High School in New Jersey, where he succeeded Joe Theismann. Drew signed with the Dallas Cowboys where he followed Bob Hayes as the primary go to Dallas Cowboy receiver. Several weeks ago Drew and myself talked about him possibly being inducted into the Ring Of Honor.Drew ever classy smiled and said ,"We will see" .Well today , Mr.Clutch will be in the Ring Of Honor ,the original clutch performer .Thanks Drew for the memories ! One of the best memories was the "Hail Mary " 1975 Divisional Play Off Game.Let's take a trip back in the way back machine tO 1975 .In the below clip you can see the game in its entirety, or if you want to see the "Hail Mary" catch roll the highlights to the end , Cowboys Win ! Cowboys Win ! The first installment of Monday Money Madness is about checking the value of your 401 K. With all the jokes about 401 K being 301 K , we probably need to check more often. Financial Analyst Phillip Lowe told me that that investors should be smart and be more discerning . That being said, watch your money in your 401 K just like you watch your gas hand. See you next week , and hopefully we will both have more money in our pockets ! Ann you have been in the vault locked up too long ! We need the rain chile, tell her Vonda , We need the Rain ! On a perfect day I can count on you , but can you stand the rain , Kick it with New Edition ! Until next week as we close the valut down for a rain delay. Let's enjoy the rain before we go back to the Texas Summer ! In the vault with all the best music video blogs! Rihanna where is my umbrella ! The NFL Hall of Fame inductions now has its latest STAR ! Deion Sanders is now the latest Cowboy to be in the Hall . There was a poster that I once had, that I gave to a family member.It said simply that water covers 3/4 of the earth and Deion covers the rest. It was true , Deion could shut down the corner ,a whole side of the field.There was no player that could do that before , no one has did it since. Deion's flair for style , often overshadowed his substance. The substance of dedicated professional who swung the balance of power from San Francisco to Dallas . Each year during the 90's it was a Deion show. Who had Deion would be the victor in those NFC Championship Games. Deion's greatest achievement is in what he does off the field.The Prime Time Show is best observed in the sun drenched pastures of the Lancaster , Texas. It was in that field during last years Super Bowl Weekend , that he received notification that he would be entering into the NFL Hall of Fame.It is that work through his "Truth Football" team that will be his true Hall of Fame moment for humanity. The Deion Sanders legacy will not be the flashy suits,the awe inspiring football career, but the words of wisdom , the thoughtful deeds not advertised or publicized as he molds young men to be not only football players but better men. Thanks Deion for what you did on the field , but off the field as well . And That's THE TRUTH !